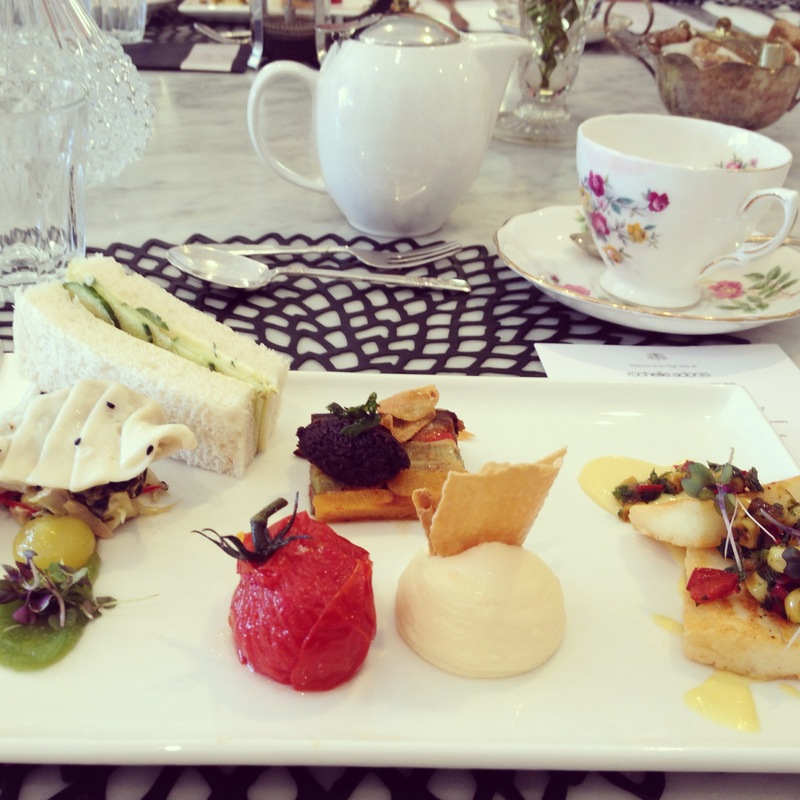 Perth high tea is either hit or miss. You get really great quality or you get normal and boring. 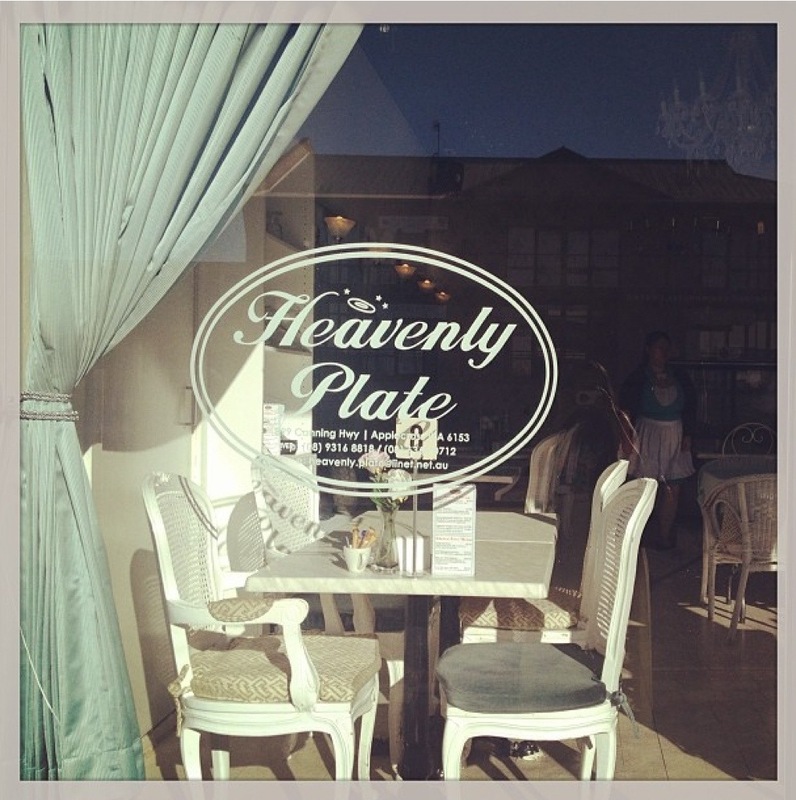 So I only found out about Heavenly Plate by going to a wedding expo and they explained that they do catering as well as high tea and normal dining. 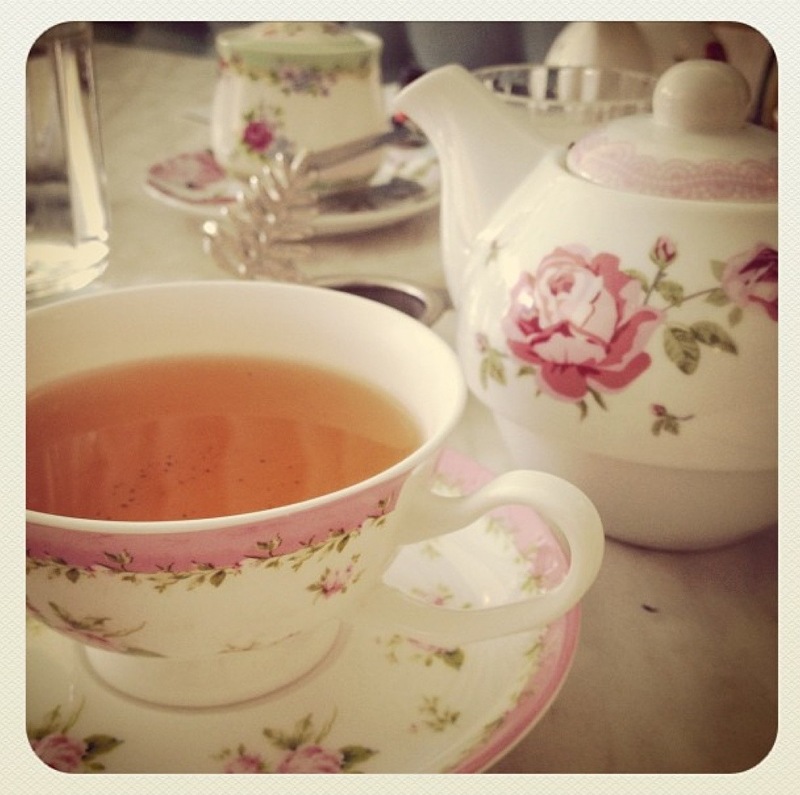 Because their set up was so vintage and elegant, it was definitely a place I wanted to visit. Upon further research, I found that this cafe was vegetarian. Perfect I thought! They use mock meats in all their dishes. I booked the Heavenly Bliss package for $50 per person. The only reason why I chose this is because it was the only option out of the 3 offered that had a savoury selection. The full selection can be found here. 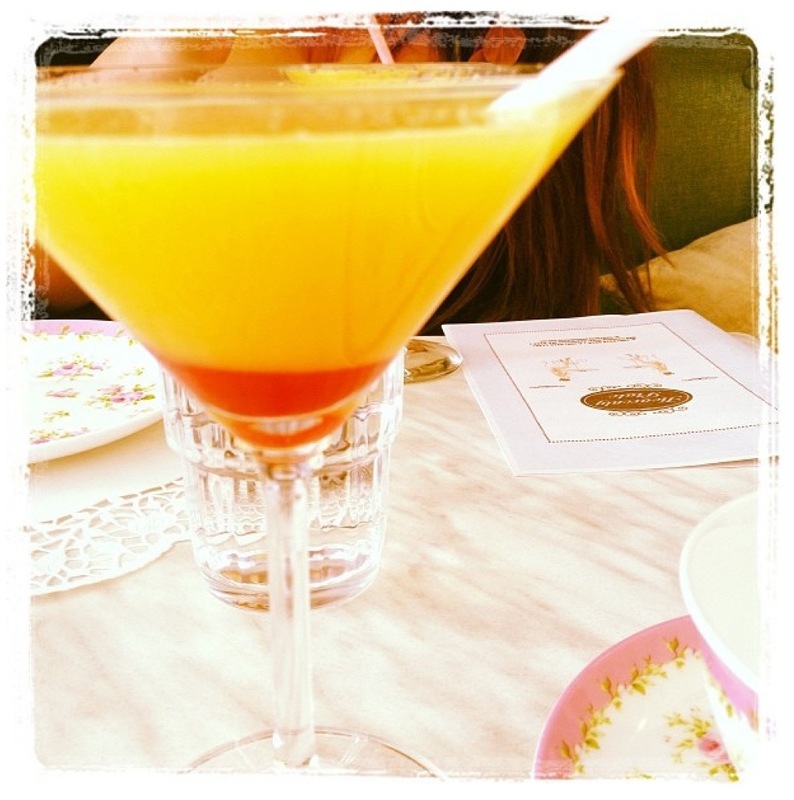 The most obvious ingredients are orange juice and grenadine based on the physical appearance. This drink is deceiving because you think you are going to get a sweet juicy taste. The weird thing is, the after taste is actually cake. My friend and I could not work out what the exact cake taste was but it messes with your mind because you are accustomed to associating an orange juice to a fruity flavour so it was pleasantly surprising having this cake aftertaste. 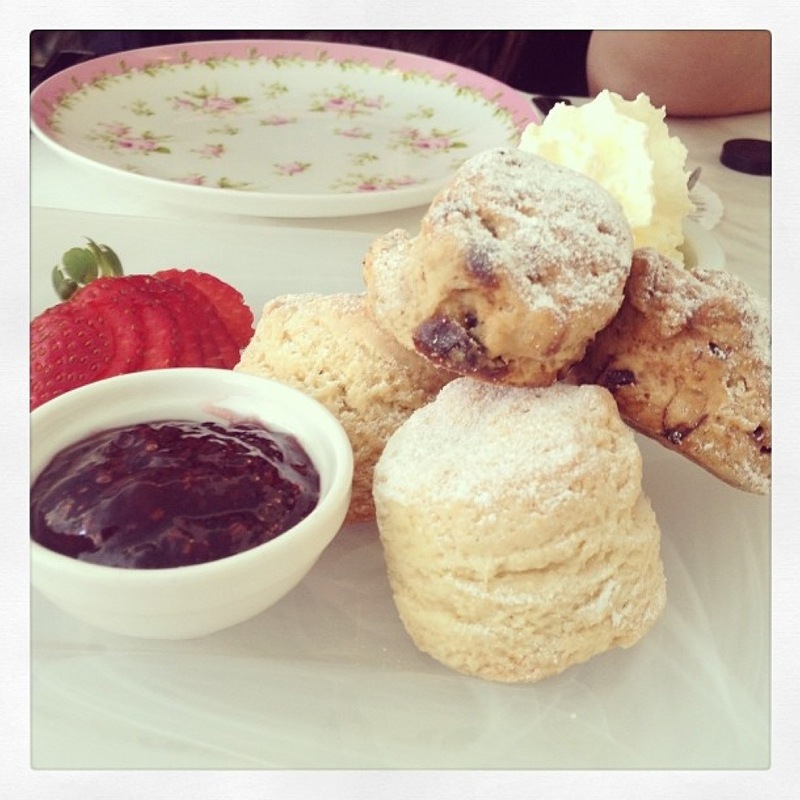 These scones were delightful ^_^ I felt they were just perfect in that they weren’t too heavy for me. Some scones can be too dry and filling but I was very happy to have this as a starter. I am in no way a jam person but I feel it obligatory to eat scones with jam and cream. You’d be crazy not to! I’m hoping the jam was home made because it wasn’t too sweet and perfect compliment to the scones. We were then asked what tea we would like. I tried the chocolate mint truffle. I have never tasted chocolate flavoured tea before so it was different but tasty. It had the mint aftertaste and also that praline truffle taste you get from eating chocolate truffles. I recommend it to anyone who loves any of these flavours. Firstly, I tried the pumpkin soup. I loved the little cup it was served in. I liked how the soup was light but filling. It was definitely not too creamy and was a perfect starter. We were given 2 sandwiches – one was tuna, beet root and lettuce and the other was chicken with cream cheese. Remember, these are mock meats. I really enjoyed the tuna sandwich because it actually tasted like real tuna. I wasn’t overly keen on the chicken cream cheese sandwich as I felt mine had too much cream cheese so I couldn’t taste anything else but that. Next I tried the yam deep fried roll (top middle in picture). I thought this was interesting. Most of the time when I eat yam, it’s always sweet. This roll was balanced in both sweet and savoury. It had just enough sweetness but also did not taste like something that was deep fried – that fatty taste. Was definitely smooth in texture and the light noodle surrounding it added a nice crunch. Down the bottom left, you can see a sushi roll. 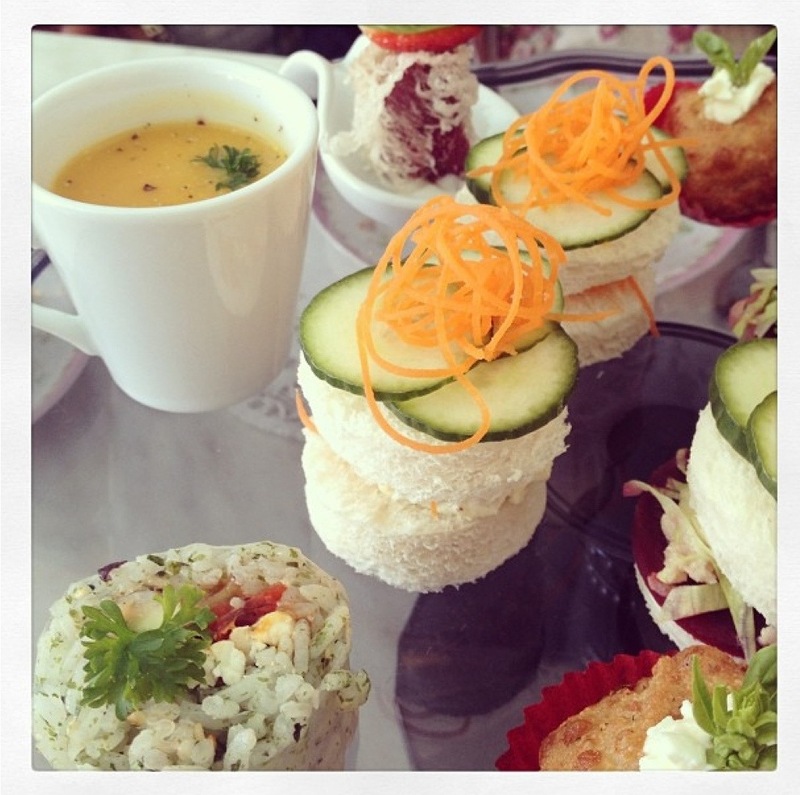 It wasn’t a standard sushi roll and was filled with Mediterranean flavours. It had an antipasto flavouring filled with eggplant, capsicum and what I thought was cream cheese. My friend thought it was egg but I felt it had some cheese texture to it. It was different and interesting. Definitely one of the top offerings on this savoury plate. Lastly on the top right, we were given a tuna and tofu ball. Now for me it reminded me of arancini. Very nice flavouring of the tuna meat inside the ball but for some reason the tofu didn’t strike my fancy. I normally eat lots of tofu but for some reason it seemed to curd like to me which put me off. Next came the broken down sweet course. Now on the other packages you get your dessert served to you on the standard tea cake tiered stand. By choosing the Heavenly Bliss package, it’s served as a broken down dessert. I think that’s what they termed it. I could be totally wrong but I am having a brain fart right now. 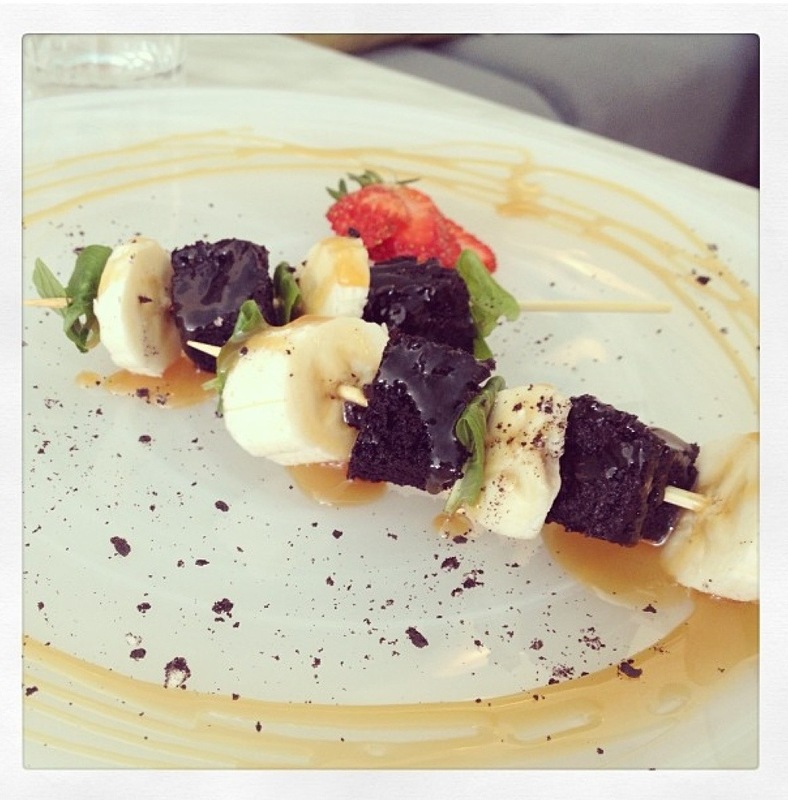 This was served on a skewer with chocolate cake, banana and caramel sauce. It looked very pretty on presentation. I thought it was nice but it didn’t surprise me with any flavours. The mint over powered the other flavours – I didn’t know if it was part of the dish or just for presentation. I tried it with mint and without. It was plain and simple really. 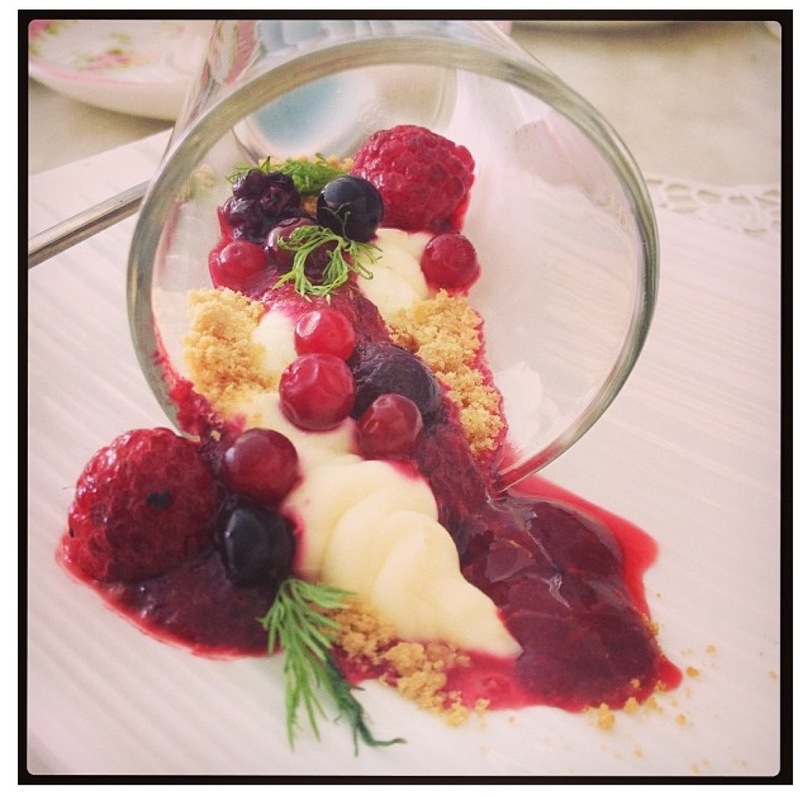 This was a really good looking dessert and it tasted like it looked – wonderful! The only thing I think it lacked was the cookie crumb. My favourite part of any cheesecake is the cookie base. If it had more than it would have been perfectly balanced. I really felt like not eating it just because I was in awe of the presentation. I tried some of the green tea, and it was very creamy and rich. 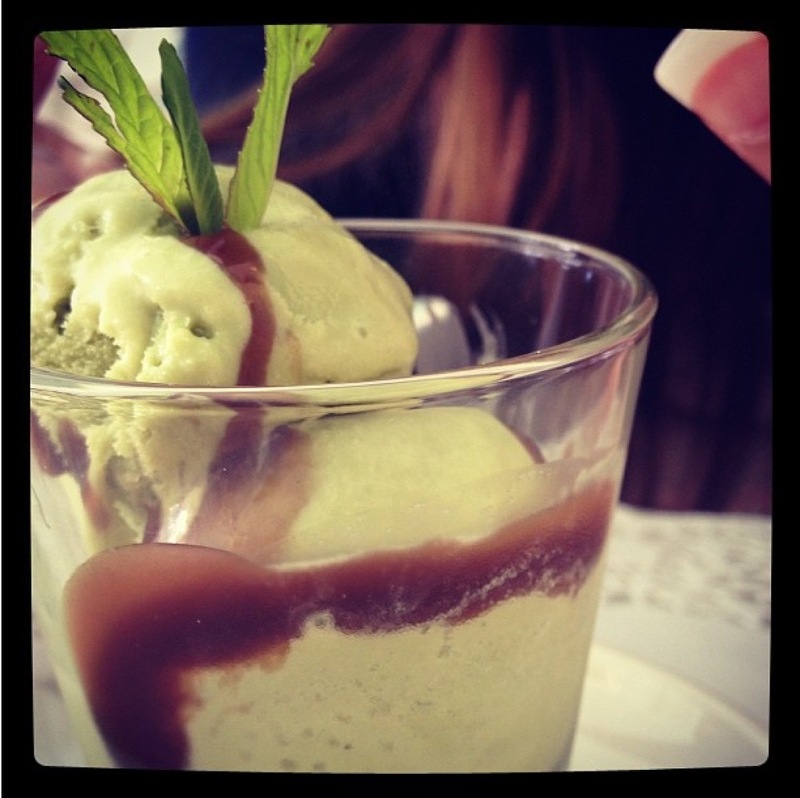 I like green tea ice cream but I know how others will dislike it. Definitely one of those flavours you love or hate. 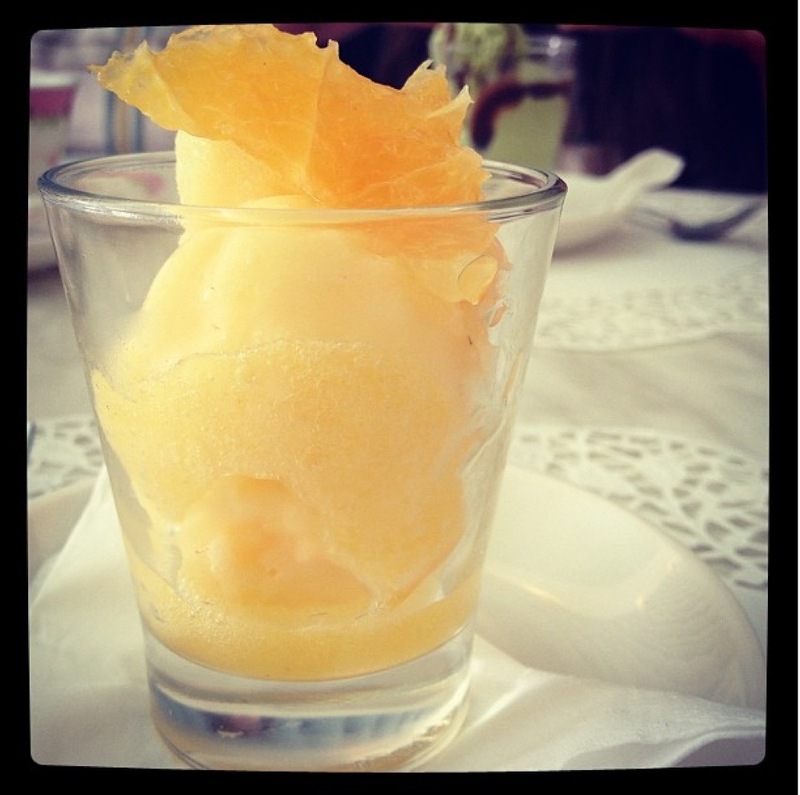 My passion fruit sorbet was to die for. It was tangy and sweet. Had the perfect balance and I would have loved to have more. 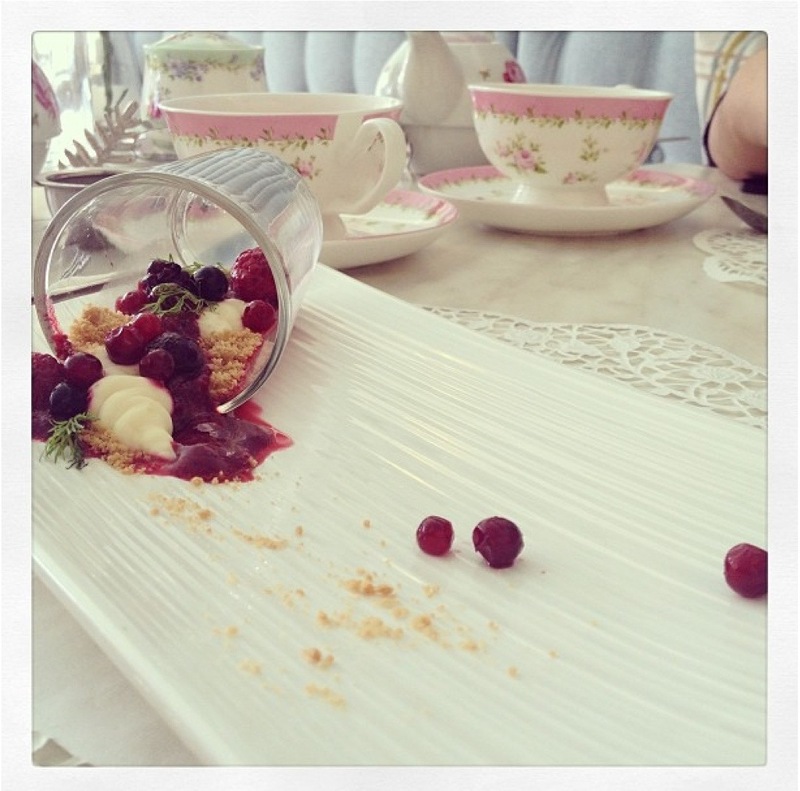 It was a perfect end to this high tea experience. If you’re ever in Perth, Western Australia definitely do try this place out. 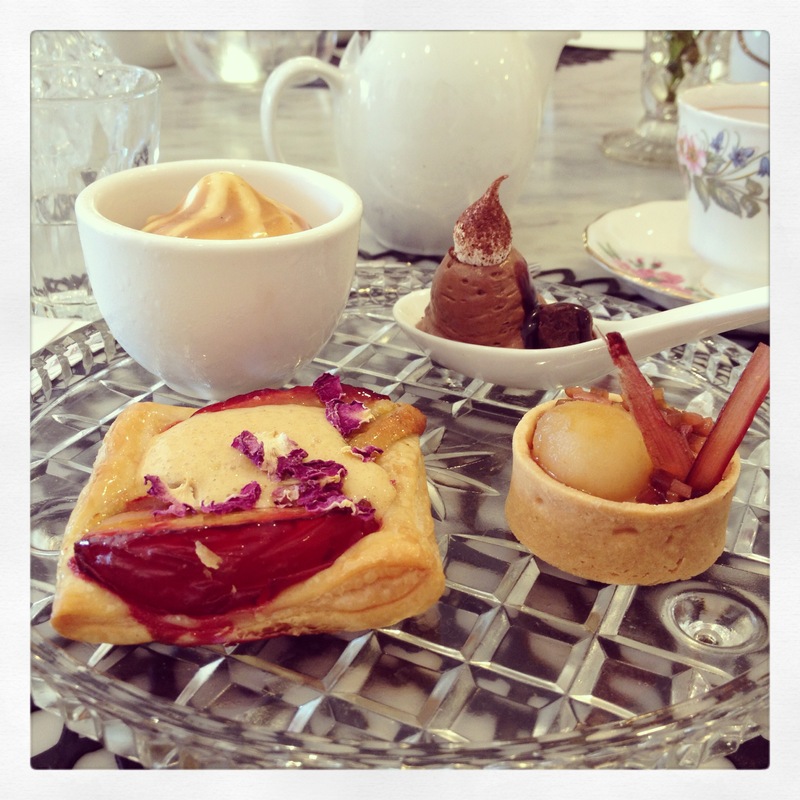 So one of my friends introduced us to Rochelle Adonis for high tea. 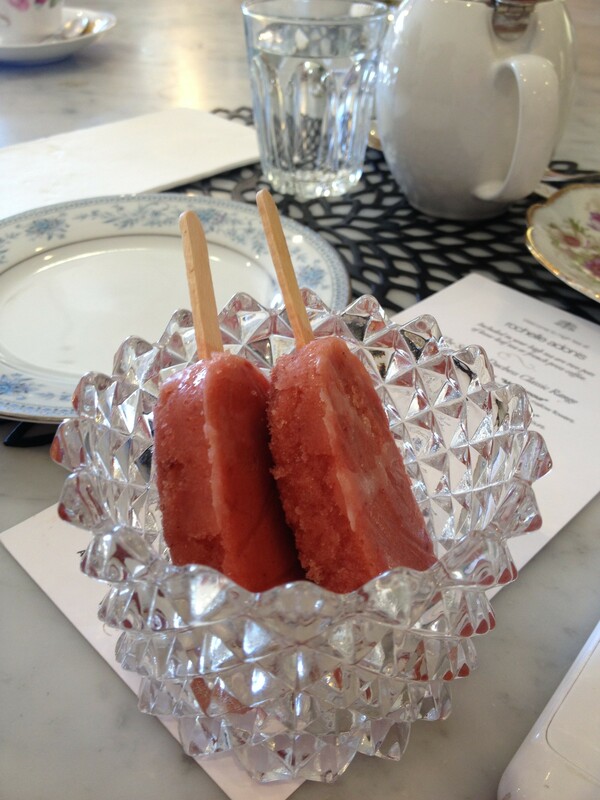 It is not traditional high tea as you share a communal table, you are served a savoury and sweet course as well as a palate cleanser. It is $49 per person and I believe is worth every penny. What’s great about Rochelle Adonis is that you never are met with the same course of food each time you visit. Expect something new every time you decide to attend! The quality of food is exquisite and it never disappoints. Afterwards, there is the option to buy the delicacies with a variation of marshmallows, butter cream cakes, macarons, ice cream and nougat – just to name a few. Savoury first course – I would list what each item was but I have no idea. Please note I am vegetarian so the meat option was quite different. Sweet course featuring a delicious chocolate mousse, apple and rhubarb tart and Rochelle Adonis Sundae that had salted caramel sauce – absolutely loved it! For anyone wanting to visit Rochelle Adonis, it is definitely worth it! Everyone has a great experience and it definitely is a must do activity in Perth, Western Australia 🙂 I would recommend everyone to try it at least once as it’s one of those experiences you’ll never forget. Makes my mouth water every time I look at the pictures!